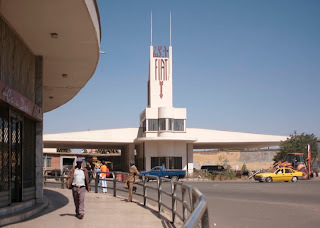 "The Fiat Tagliero Building in Asmara, capital city of Eritrea, is a Futurist Style service station completed in 1938 and designed by the Italian architect Giuseppe Pettazzi. From the beginning conceived as a simple petrol station, Pettazzi designed a building that resembles an aeroplane. It consists of a central tower which incorporates the office space and cashiers desk and shop. Either side of the main tower there are a pair of cantilever wings which are each 15m (50ft) in length. The wings are built in re-enforced concrete and are structurally unsupported. Because of law in Italy (and therefore Eritrea — an Italian colony) during the 1930s, the wings legally had to be supported, so on the technical drawings of the building there are wooden pillars which prop up the wings. The day before its inauguration, workers who completed the construction refused to remove the supports used during construction fearing the wings would collapse. Pettazzi settled the argument by climbing to the end of one of the wings and, holding a revolver to the main builder's head, threatened to kill him if they did not remove the supports. In the end the supports were removed and the wings held, just as they do today. The building is incredibly well-built, and has had almost zero maintenance for over 75 years. Luckily, the building has not been damaged during the numerous conflicts that have affected the Horn of Africa over the past century, and so it stands today. The building is Category I listed in Eritrea. This means that not any part of the building may be adjusted in any way." Fascinating story, and fantastic building. When was the photo taken ? It's really a great story. The Building was rehabilitated. So it looks like new. sem duvida uma obra prima!!! parabens por este post castro! The Wings are 15 meters each. Wikipedia had been edited wrong. I fixed the entry.